Beauty is a principle that man has grappled with for centuries and some would argue, since the beginning of time. The concept of beauty and its interrelation with facial proportions has long been contemplated by Dr. Yuriy May during his extensive studies in “Beauty & Symmetry of Facial Dimensions” during which time he understood that the forms of facial attractiveness, and indeed the form of beauty in general, to be composed of, or the result of, two ideal components: Symmetry and harmony and a third unique variable: Facial features. Symmetry is defined as the mirror image of parts or components about an axis. By all accounts a beautiful face is symmetric. Harmony can be defined as a recurring theme. 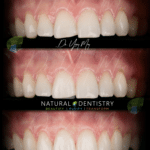 Why has Dr. Yuriy May | Natural Dentistry gained notoriety in Cosmetic Dentistry so quickly? At Natural Dentistry, the entire orofacial and craniofacial philosophy is anchored on true biomimetic function and dental esthetics. In order for facial and individual beauty to be achieved, both cranial, facial, dental and oral concerns need to be evaluated, understood and ultimately addressed. 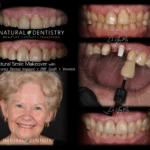 The challenge of combining the triad of phonetics, function, and esthetics has always been the primary restorative goal of exceptional dentists like Natural Dentistry’s Dr. May, however, it remains a rare concept to average dentists across the USA. As the access to information continues to increase, the cosmetic understanding and savviness of patients increases, creating unprecedented demand for highly specialized dentists like Dr. May to integrate the full spectrum of all esthetic dental aspects that can be improved for a particular patient. The overall esthetic appearance of a human smile is governed largely by the symmetry and proportionality of the teeth that constitute the smile. Asymmetric teeth or teeth that are out of proportion to the surrounding teeth disrupt the sense of balance and harmony essential for optimal esthetics. Assuming that the patient’s teeth are aligned normally (i.e., rotations or faciolingual positional defects are not present), dental symmetry can be maintained if the sizes of contralateral teeth are equivalent. A dental caliper should be used in conjunction with any conservative esthetic dental procedure that would alter the mesiodistal dimension of teeth. This recommendation is particularly true for procedures such as diastema closure or other procedures involving augmentation of proximal surfaces with composite. By first measuring and recording the widths of the interdental space and the teeth to be augmented, the appropriate amount of contour to be generated with composite resin addition can be determined When dealing with restorations involving the midline, particular attention also must be paid to the incisal and gingival embrasure forms; the mesial contours of both central incisors must be mirror images of one another to ensure an optimally symmetric and esthetic result. In addition to being symmetric, anterior teeth must be in proper proportion to one another to achieve maximum esthetics. The quality of proportionality is relative and varies greatly, depending on other factors (e.g., tooth position, tooth alignment, arch form, configuration of the smile). One long accepted theorem of the relative proportionality of maxillary anterior teeth typically visible in a smile involves the concept of the golden proportion2. Originally formulated as one of Euclid’s elements, this theorem has been relied on through the ages as a geometric basis for proportionality in the beauty of art and nature.3 On the basis of this formula, a smile, when viewed from the front, is considered to be esthetically pleasing if each tooth in that smile (starting from the midline) is approximately 60% of the size of the tooth immediately mesial to it. Although the golden proportion is not the absolute determinant of dental esthetics, it does provide a practical and proven guide for establishing proportionality when restoring anterior teeth, especially if these teeth are considered long. However, according to a study by Preston, only 17% of the population naturally exhibits smiles that meet the golden proportion as the recurring esthetic dental proportion.4 According to a survey of dentists by Ward, a recurring esthetic dental proportion of 70% (as opposed to 61.8 % as with the golden proportion) is preferred when teeth are of normal dimension.5 The reality is few dentists, if any, can match naturally talented and exceptionally trained smile specialists like Dr. Yuriy May in his smile analysis, smile design and surgical skill in the dentofacial esthetic realm. The most important aspect of performing smile makeovers also known as “orofacial plastic surgery” is knowledge of three-dimensional regional anatomy. For example, each nerve and blood vessel takes up space three-dimensionally. It’s critical for any surgeon and dentist recreating ideal biomimetics to recognize how these structures travel on the surface plane, but it is even more important for the success of the actual smile makeover surgery to know which tissue layers these structures run through. Anatomical atlases and textbooks provide detailed images of these structures, but the knowledge gained from them is two-dimensional. Novice dentists typically memorize the two-dimensional image of teeth and the surgical or reconstruction field. Because of this, surgical results are sometimes unsatisfactory, or unexpected surgical complications may occur. To perform dentofacial smile makeovers with a high degree of difficulty, a smile surgeon has to be able to vividly visualize the three-dimensional regional anatomy of the dental anatomy and surgical field of soft tissue (gums). During facial reconstruction residency, experts like Dr. Yuriy May had to study the regional anatomy in anatomical atlases and textbooks of all facial, cranial and oral ecosystem, and to ultimately confirm their anatomical knowledge in delivering highly esthetic and functional smile results. 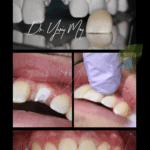 By repeating this pattern many times, Dr. Yuriy May was able to establish and practice three-dimensional anatomical tooth and jaw knowledge outpacing other dental professionals by more than just a margin. By having dental reconstruction smile design training based on accurate and meticulous 3D anatomical knowledge, a smile expert like Dr. May is be better equipped to perform high-degree smile makeover procedures compared to the average dentist that does not specialize in extensive and highly predictable biomimetic smile reconstruction. The anatomy of the head and neck is extremely complicated and the details differ among individuals and during different stages of life. These differences include the thickness of the tissues, their changes in response to aging, and even anatomical variations in vessels, nerves, and muscles. Each organ in the head and neck region has a very distinct function. Consequently, pathologies involving the head that require surgery will be operated on by dentists and oral surgeons specializing in neurosurgery, otorhinopharyngolaryngology, ophthalmology, dental medicine, and cosmetic dentistry. While in-depth knowledge in the anatomical area of specialization is important in treating patients, Dr. May as the dental surgeon as well as the medical staff must also be highly familiar with not just related regions of the body but also with unrelated regions. Unfortunately, in medical and dental education, the importance of physiology and anatomical education has been downplayed resulting in sub-optimal smile makeovers, oral reconstruction, facial reconstruction and a move away from delivering a natural and highly esthetic result. The answer to the dilemma, as Dr. Yuriy May found, is to study anatomy, continuously, and through various medical textbooks describing physiology, until the full anatomy of the cranium, orofacial and craniofacial physiology and everything in between is permanently ingrained in the orofacial reconstruction surgeon’s mind. In esthetic treatment, it is important to start visualising the final result as early as possible in the smile makeover process and to continue this visualization throughout treatment. This is the reason Dr. May uses significant drawings and computer aided design (“CAD”) to create, design and generate 2D Smile Architecture with mathematical proportions of the face and dentolabial analysis, 3D Smile Design to show angulation and depth of every augmented change on the tooth. 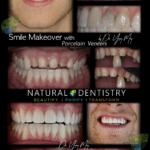 At Natural Dentistry, the most sophisticated Digital Smile Design (“DSD”) techniques are used to design and plan smile enhancements and to communicate the visualization to the ideal patient. This ensures that all parties involved in the treatment have the same endpoint in mind and allows changes to be made prior to the final restorations being cemented.